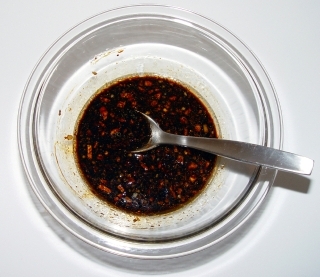 This Teriyaki marinade recipe is a fundamental, "must-have" marinade if you're really interested in producing true Asian flavors on your grill. Teriyaki refers to a Japanese cooking style that uses soy sauce in the marinade and also combines sugar or honey in the recipe that gives the meat a nice shiny lustre when it's cooked. This recipe in particular combines a sweet sesame oil flavor in place of the traditional teriyaki sweet sugar ingredients. 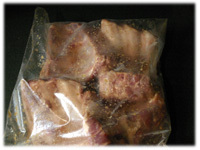 This picture below is our newest Teriyaki barbeque pork ribs recipe having a soak in the marinade before grilling. This is also a great teriyaki recipe for grilled pork chops or these sweet and sticky chicken wings. 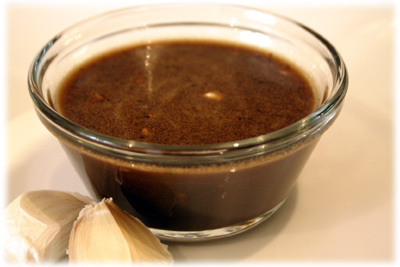 Finish off any dish soaked in this marinade with this Teriyaki sauce recipe. In a glass mixing bowl combine all of the teriyaki ingredients and mix well. Cover and set aside or refrigerate until needed. When using this marinade recipe it's helpful to place the meat (or veggies) in a resealable plastic bag. Pour in the marinade and place the bag in a shallow dish in the refrigerator in case of leaks. Try to turn the bag over and squish the food around in side to completely cover several times during the marinating period.